Departs: Cape Town, South Africa. 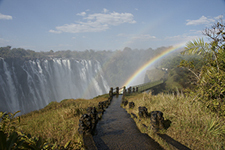 A small group lodge safari, from Cape Town to Victoria Falls through South Africa, Namibia, Botswana and Zimbabwe. 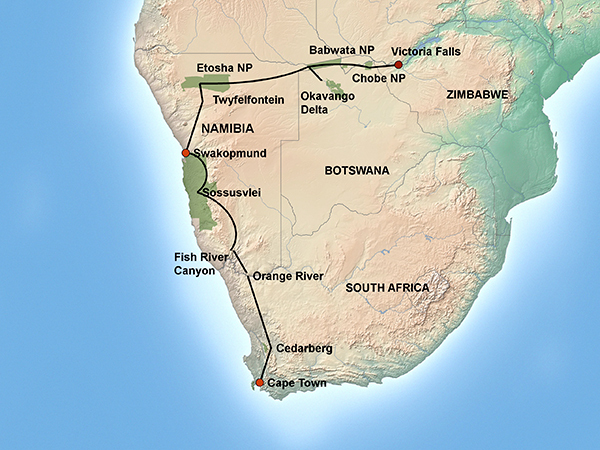 Cape Town, Cedarberg, Orange River, Fish River Canyon, Sossusvlei, Sesriem, Swakopmund, Himba Experience, Rock paintings in Brandberg and Twyfelfontein, Etosha National Park, Okavango Delta, Caprivi, Mahangu National Park, Chobe National Park, Victoria Falls. 21x Breakfast, 18x Lunch, 12x Dinner. Where included most breakfasts and dinners will be enjoyed in the restaurants of the various accommodation establishments, however on certain nights the guide will provide an authentic meal for the group, which will be enjoyed together in the evening, often around a camp fire. Please advise us of any special dietary requirements in advance. 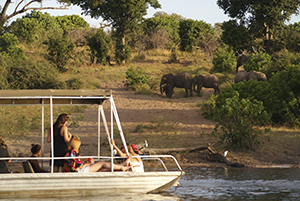 SAFARI COST: $3,700 per person sharing, plus local payment of ZAR 2,200 (in cash). Overnight: The Townhouse Hotel or similar (rooms with en-suite bathrooms, bar and restaurant). Overnight: Clanwilliam Lodge or similar (rooms with en-suite bathrooms, restaurant, bar and swimming pool). Meals: Breakfast at Townhouse Hotel or similar, Lunch prepared by guide, Dinner at Clanwilliam Lodge or similar. Meals Day 3: Breakfast at Clanwilliam Lodge or similar, Lunch prepared by guide, Dinner prepared by guide. Meals Day 4: Breakfast at Felix Unite or similar, Lunch packs by Felix Unite or similar, Dinner prepared by guide. Today we head to Ai-Ais, where we stop for lunch. Here thermal water rich in sulphates and fluorides and with a temperature of approx. 60°C gushes forth from the hot springs. In the Nama language, "Ai-Ais" means "burning water". 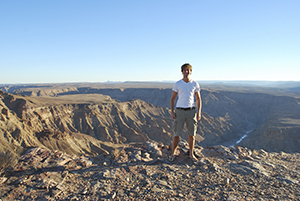 We then proceed to our accommodation which is situated close to the Fish River Canyon, the second largest canyon on earth. Later in the evening we take in another perfect African sunset with the magnificent views and scenery along the edge of the canyon. Overnight: Canyon Roadhouse or similar (rooms with en-suite bathrooms, swimming pool, bar & restaurant). Meals: Breakfast at Felix Unite or similar, Lunch prepared by guide, Dinner at Canyon Roadhouse or similar. 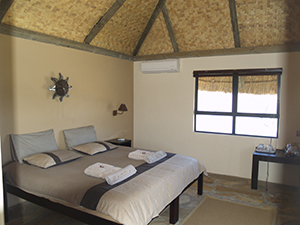 Overnight: Agama River Camp or similar (chalets with en-suite bathrooms, swimming pool, bar & restaurant). Meals Day 6: Breakfast at Canon Roadhouse or similar, Lunch prepared by guide, Dinner prepared by guide. Meals Day 7: Breakfast packs from Agama River Camp or similar, Lunch pack prepared by guide, Dinner at your own account. Meals Day 8: Breakfast at Agama River Camp or similar, Lunch prepared by guide, Dinner at your own account. Meals Day 9: Breakfast Hotel A La Mer or similar, Lunch at your own account, Dinner at your own account. 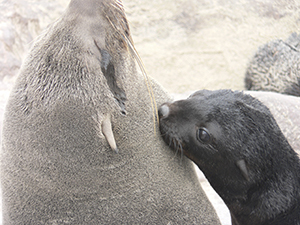 We follow the barren Atlantic Coast on our way out of Swakopmund to visit Cape Cross - the largest breeding place of the Cape Fur Seals. Leaving the cold Atlantic coastline behind, we then head inland across the desert plains for Brandberg, the highest mountain in Namibia. Either this afternoon or the next morning we take a walk to visit the “White Lady” one of the most famous rock paintings in the area. 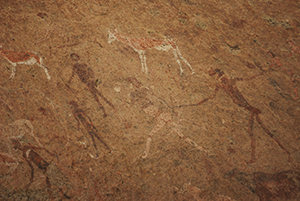 The footpath to the site offers spectacular views over the plains of Damaraland. 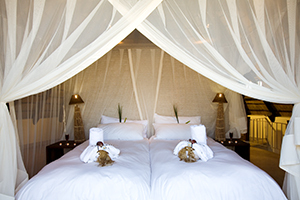 Overnight: Brandberg White Lady Lodge or similar (rooms with en-suite bathrooms, swimming pool, bar & restaurant). Meals: Breakfast at A la Mer or similar, Lunch prepared by guide, Dinner at Brandberg White Lady Lodge or similar. Meals: Breakfast at Brandberg White Lady Lodge, Lunch prepared by guide, Dinner at Oppi Koppi Restcamp or similar. Meals: Breakfast at Oppi Koppi Restcamp or similar, Lunch prepared by guide, Dinner at Okaukuejo or similar. Overnight Day 13: Okaukuejo or similar (rooms with en-suite bathrooms, swimming pool, bar & restaurant). Meals Day 13: Breakfast at Okaukuejo or similar, Lunch prepared by guide, Dinner for your own account. Overnight Day 14: Namutoni or similar (rooms with en-suite bathrooms, swimming pool, bar & restaurant). Meals Day 14: Breakfast at Okaukuejo or similar, Lunch prepared by guide, Dinner for your own account. Meals: Breakfast at Namutoni or similar, Lunch prepared by guide, Dinner at own account. Overnight: Guma Lagoon Camp or similar (permanent tents, with en-suite bathroom, bar area). Meals Day 17: Breakfast at Kaisosi River Lodge or similar, Lunch prepared by guide, Dinner prepared by guide. Meals Day 18: Breakfast Guma Lagoon Camp or similar, Lunch pack from Guma Lagoon Camp, Dinner prepared by guide. Meals: Breakfast at Guma Lagoon Camp or similar, Lunch prepared by guide, Dinner prepared by guide. Meals Day 19: Breakfast at Camp Kwando or similar, Lunch prepared by guide, Dinner at Chobe Safari Lodge or similar. Meals Day 20: Breakfast at Chobe Safari Lodge or similar, Lunch and Dinner at your own account. 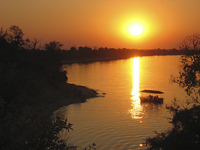 Overnight: A'Zambezi River Lodge (rooms with en-suite bathrooms, swimming pool, bar & restaurant). Meals: Breakfast at Chobe Safari Lodge or similar, Lunch pack prepared by guide, Dinner at your own account. 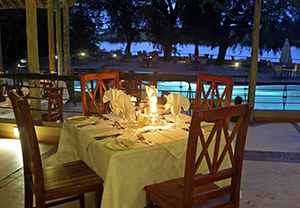 Meals: Breakfast at A’Zambezi River Lodge or similar. Twenty-one nghts in fixed accommodation, all transport in fully equipped vehicle, game drives and activities as mentioned, meals as per itinerary, park entrance fees, experienced local guide. 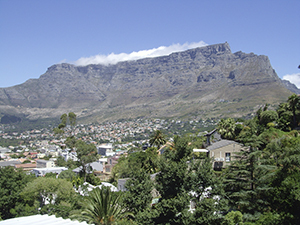 The Northern Experience Safari departs from The Townhouse Hotel in Cape Town. Fully equipped Toyota Land Cruisers, 12-seater 4x4 safari vehicles or other appropriate vehicles with comfortable seating, large windows for game viewing, a music- and PA-system and air-conditioning. All luggage, besides hand luggage and photo equipment, is carried on the vehicle or trailer roof racks to ensure maximum comfort in the vehicle. For transfers between Kasane and Victoria Falls (or vice versa), 2x4 vehicles may be utilized. We try to prepay as many of the costs as possible however in some cases cash payment on arrival is the only option as some of the attractions we visit on safari only accept cash. Examples include park fees at most of the national parks, a few accommodations or camp sites and any local food markets we visit to stock up on fresh produce during the tour as well as local guides. Your tour guide is given a garage card to pay for fuel, however this is only valid for use in South Africa and certain parts of Namibia therefore any other fuel purchases also need to be paid for in cash. Cape Town has traditionally been the gateway between Europe and Southern Africa and this is still evident in its atmosphere, its playful character, its people and even its architecture. The 'Mother City' as it's known locally has no shortage of attractions. It's a magnetic, multi-cultural city with an array of diverse offerings within a small, accessible area, surrounded by spectacular topography. Spectacular beaches, mountains (incredibly unique bio-diversity), hiking, water-sport, shopping centers, markets, theatres, museums, historical & cultural attractions, a first-rate waterfront, galleries, night-clubs, restaurants and an abundance of activities to suit all, are prolific in this world-class destination. This 1086 m sandstone landmark dominates the city and has to be ascended! This is a fantastic way to gain a perspective on the city, with some breathtaking views of the peninsula, as well as an opportunity to experience the most concentrated, yet diverse, ecosystems in the world. The mountain is home to more than 1450 species of plants, many of which are not found anywhere else in the world, such as the Silver Tree and the wild orchid Disa Uniflora. Table Mountain is classified as the smallest of the six floral kingdoms of the world. The 'flat' top of the mountain is approximately nearly 3 km in length and sees almost a million tourist& hikers per year. Constantia, a meager 20 minutes from the city centre, is the birthplace of the wine farming industry in South Africa. Still today, five wine farms in this area produce worldclass wines, recognized for their escalating quality. Further from the city, a drive of approximately 45 minutes north from Cape Town brings you to a region where grand mountains from a dramatic backdrop to lush vineyards and historic gabled Cape Dutch homesteads. Almost 100 wine farms on four wine routes in this region alone boast not only a multitude of award winning wines, but also restaurants, wine tasting and activities. In the wine regions visitors can also experience a number of quaint villages & towns (especially Paarl, Stellenbosch & Franschoek), cheese shops, a crocodile farm, a cheetah rehabilitation centre, hikes and rivers activities. As one of the most successful developments in the history of Southern Africa, the Victoria & Alfred Waterfront is a comprehensive shopping and recreational destination ranking amongst the best waterfronts in the world. It's Cape Town's most popular local attraction and has over a million visitors per year, 70% of which are Capetonian. An array of shops, markets, restaurants, cinemas, a theatre, boat trips, helicopter trips, a brewery, hotels as well as a newish residential development can all be found within walking distance and surrounded by a working harbor. Two hours north of Cape Town, over the Piekenierskloof pass; you descend into a different world – of wild, raw, dramatic beauty. The towering mountains, often a brilliant purple in the late afternoon light, preside over fruit-filled valleys and true rock wilderness. The magnitude of this wilderness is truly awe-inspiring. 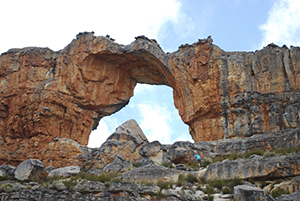 Deep into the Cedarberg wilderness area one is able to walk in the mountains, explore ancient San rock art, relax in natural rock pools and enjoy the peace of this unspoiled paradise. North of the Cedarberg wilderness, hour's drive from the highway lays the Biedouw Valley (the world's first producers of Rooibos tea) where city folk flock in August & September for the spectacular sight of wild spring flowers. Once through this picturesque valley the historic mission village of Wupperthal lies deep in the Cedarberg. Namaqualand is the famous flower wonderland. This desert landscape has extremely sensitive veld conditions and fascinating plants unique to this area. Come the brief rainy season the landscape undergoes a drastic transformation and the wild spring flowers provide a spectacular flower show. Flowering starts north and spreads southward, but is hard to predict and depends on weather conditions especially berg winds. The flower season progresses as the weather becomes warmer. Some of the specific areas of interest include the Skilpad Flower Reserve, an ideal place to observe the spring flower spectacular during July and September. The Richtersveld National Park desert reserve is known for its prolific bird life, while Goegap Nature Reserve has 600 types of flower and 45 mammal species, especially the bat eared-fox. 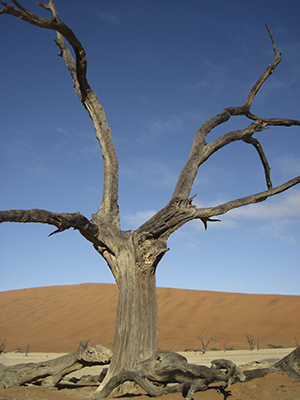 The visual spectacular in the Sossusvlei area is unsurpassed. Amongst the continuous towering dunes as far as the eye can see is arguably the highlight of the Namib Desert, the Sossusvlei, an enormous clay-pan, enclosed by dunes. After a heavy rainfall, rare in this area, the vlei fills with water and, as the clay layers are virtually impermeable to water, a turquoise lake remains for quite some time. The dunes and their rich tints vary from pale apricot to vivid reds and oranges, and contrast vividly with the dazzling white surfaces of the white clay pans, or lakes, below. During the rainy season one of the larger of these pans creates a haven for water birds, often including flamingos. Even during the dry season, Oryx, springbok and ostriches can be seen feeding off the sparse vegetation along the watercourses. The dunes of the Namib Desert developed over a period of many millions of years and are shaped by strong-multi-directional winds. It is thought that the vast quantities of sand were carried into the Atlantic Ocean by the Orange River. The surf pushed the sand back onto land and coastal dunes formed. Dunes have subsequently shifted inland and northwards. Wind continuously re-stacks the sand of the huge shifting dunes of the Namib Desert. It tirelessly forces the grains of sand on the flat windward slope upwards to the crest of the dune. Here they fall down in the wind shade. The leeward slope, therefore, is always considerably steeper than the windward side. Erosion of many centuries has incised a narrow gorge through which the Tsauchab River disappears dramatically down a steep gorge in the plain. This gorge, Sesriem Canyon,about 1 km long with pools along the ways and a 30-40 m pool at its end. These pools of water on a gravel bed in an otherwise arid region, attracts many birds and animals. 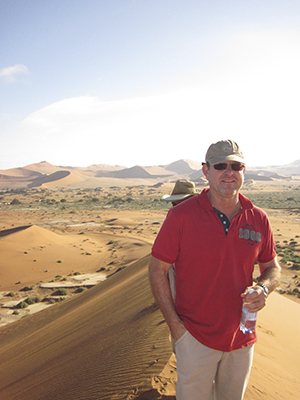 The Namib-Naukluft National Park is an incredibly unusual and diverse 'superconservation' area. There is nothing quite like it. It's probably the most unusual in the world – an ancient land with an ageless spirit. It covers almost 50 000 km2 and is ranked as the 4th largest in the world (the largest nature conservation area in Namibia) with landscapes including an impressive mountain massif, desert plains, high sand dunes, deep gorges and an estuarine lagoon. In truly African light show there is often clear and sometimes sudden shift in the mood of the moment, as light, textures and shadows give desert landscapes entirely new characters. 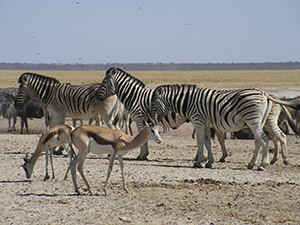 Survivors in this harsh landscape include the Oryx, springbok and zebra as well as the Welwitschia mirabilis, an odd-looking desert shrub. One large, protected specimen is estimated at 1 500 years old. A true oasis and respite from the solemn desert and its monotonous heat. A seaside holiday resort full of old-world charm and modern amenities, from the quaint German colonial influences to a funky Internet café. The tranquil setting includes promenades, palm trees and beautifully tended public gardens, the Swakopmund museum (covering natural history, mineralogy, botany, historical and ethnological aspects), the National Marine & Research Centre, an aquarium, a public library, an Olympic sized, heated indoor swimming pool and a grassed golf course in a desert setting. This 'middle of the desert' feel is one of its attractions – one can enjoy the wild expanse of the adjacent desert and sea and yet be within easy reach of the creature comforts of Swakopmund's hotels, restaurants, bars and a much-needed laundries! There is plenty to see and do and activities include quad biking, sand boarding, rock & surf fishing and skydiving. 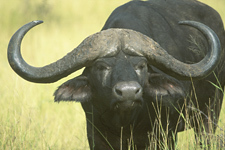 The Okavango Delta in northern Botswana near Maun incorporates the Moremi Game Reserve and is a unique wildlife paradise - one of the finest in the world. It is one of the largest inland river deltas in the world. 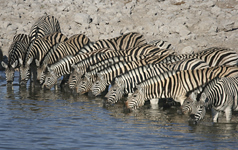 This unsurpassed natural environment is a maze of waterways, islands and reed banks creating a perfect place for lion, elephant, leopard, buffalo, giraffe, hyena, wild dog, kudu, impala, roan, zebra, lechwe, hippo, and crocodile, amongst others. 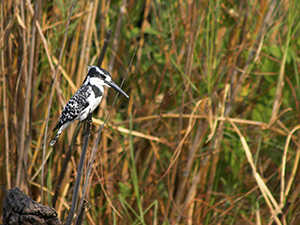 There are 440 bird species in the delta and fish species are also abundant, including tiger fish, sharp-toothed catfish, barbell and bream. Travel through the swamps and surrounding areas is generally by open 4x4 game viewing vehicle or a peaceful meander in a 'Mokoro', a flat-bottomed dugout canoe. 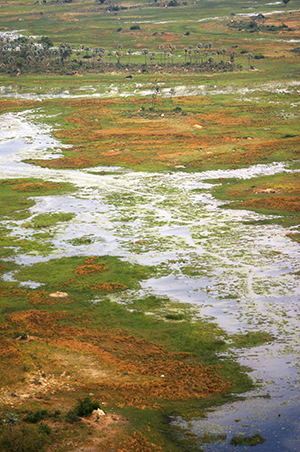 The Delta is hot throughout the year with temperatures ranging from about 14°C in January to 24°C in July. Rainfall averages 525 mm annually, but varies greatly from year to year. 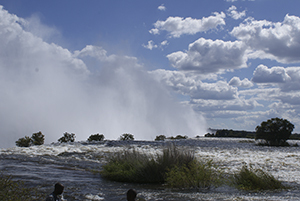 Water levels and flooding reach a maximum between March and July, after rains at the source and the usual 15 000 km2 can expand to approximately 22 000 km2 in high-rainfall years.